Little-known Vogel Canyon in southeast Colorado, where a placid, French-named river meanders through the landscape, affords glimpses of petroglyphs and the remains of an 1870s stagecoach stop. 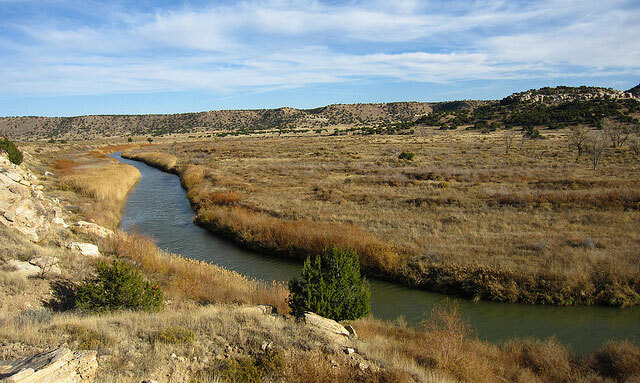 Etched by the Purgatoire River from the surrounding sandstone, Vogel Canyon sits 13 miles south of La Junta in southeast Colorado on the Santa Fe Trail Scenic and History Byway. After traversing miles and miles of prairie land, imagine how the American Indians must have felt when they stumbled upon this beautiful mark of Mother Nature 800 years ago. Today, you can still see some American Indian petroglyphs decorating the canyon walls while hiking the area’s four easy-to-moderate trails — Canyon, Mesa, Overlook and Prairie. In the 1870s, a stagecoach stop was built in the canyon; its rock remains can still be viewed today. The springs on the canyon floor quench the thirst of wildlife including jackrabbits, great horned owl, pronghorn, coyotes and more. For the best chance of spotting them, visit in the early morning or at dusk. Vogel Canyon is open year-round and it’s particularly spectacular when the spring flowers burst into bloom. Even if you don’t want to hike, it’s a great place to stretch your legs and have a picnic lunch when you’re on the Santa Fe Trail. Drive south from La Junta on CO Hwy. 109 for 13 miles. Turn west (right) on CR 802; follow for 1.5 miles. Turn south (left) on Forest Service Rd. 505A. Follow for 1.5 miles until you reach the parking lot for Vogel Canyon.